One of the highlights of a sailing holiday or gulet cruise in Turkey is a visit to Ephesus, situated near the yacht charter and sailing port of Kusadasi, the Ionian coast. The large archaeological site of Ephesus harbours the Temple of Hadrian, the Library of Celsus (see photo), Gate of Hercules, an amphitheatre, etc, and indeed the excavations span a square kilometre and are comparable to Delos. The best ports for sailing holidays and yacht charters are Izmir or the Bodrum yacht charter base. 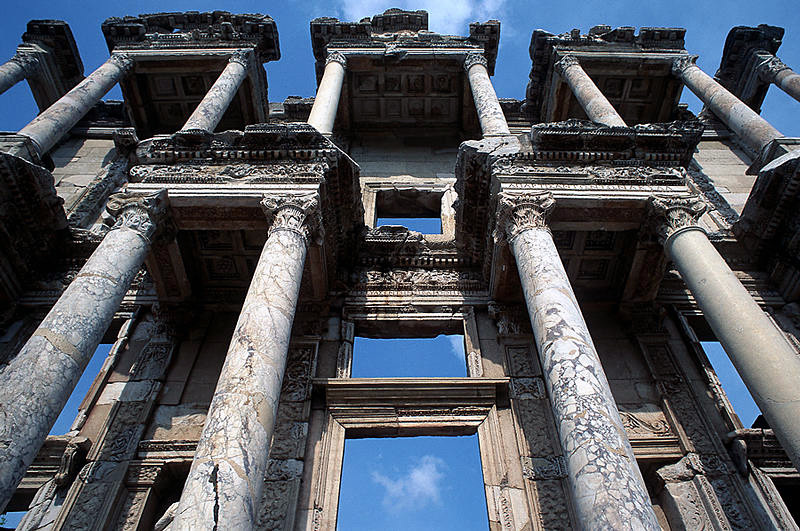 With luxury gulet cruises, or Blue cruises an excursion to Ephesus is usually included. The library of Celsus, which was entirely face with coloured marble, was of three storeys, with colonnades round the lower two storeys. Along the rear wall was a series of rectangular niches for holding parchment books and scrolls.